Lapsed donors are those who have donated to your organization in the past, but haven't donated this year. Two common lapsed donor reports are LYBUNT (donated Last Year But Unfortunately Not This year) and SYBUNT (donated Some Year But Unfortunately Not This year). • For a LYBUNT report for 2018, you want to grab everyone whose last contribution happened anytime in 2017. So for this case, we'll choose Last Contribution Date = Between and set the date ranges to January 1, 2017 - December 31 2017. • For a SYBUNT report for 2018, you want to grab everyone who donated any time before 2018. In this case, we'll choose Last Contribution Date = Before and set the date to December 31, 2017. Unless you want to filter by additional parameters, you can leave Contact Type, Tag Type, and Contribution Amount set to "All." Click View Full Report , choose "Send me the report via email (CSV format)", enter your email, and click Get Report. You will be emailed a link to download your generated CSV file. Because we already filtered only donors who did not donate in the current year 2018, we already know their 2018 Donations and Amount fields are zero and we don't need these fields. Once you have the fields you need, you can delete all extraneous fields. Optional: Sort your report based on one of the donation (or contribution*) fields, such as "2017 Donations" to order your list in descending or ascending order. Now you have a list of all donors who contributed at some point, but definitely didn't do so this year. You have their names, contact information, and donation habits for targeting and outreach to motivate them to give again! *Important Note: In Flipcause, "Contribution Amount" indicates any contributions, which includes all financial activity including donations, registration, online store, sponsorship, etc. 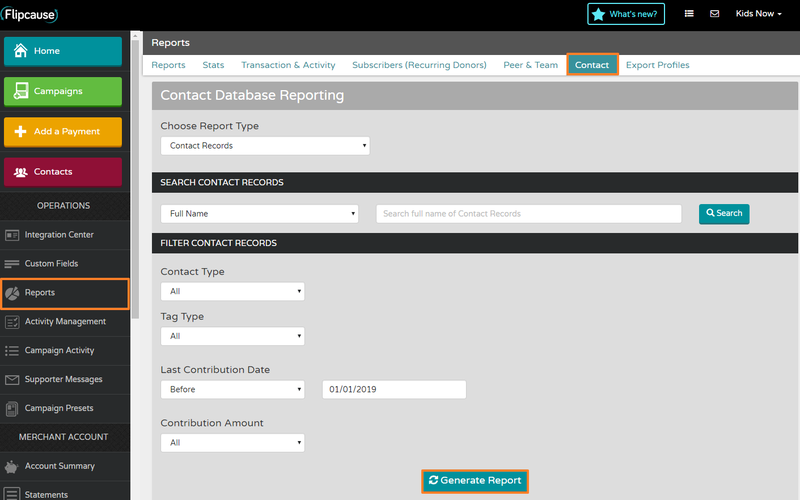 With lapsed donor reports, it's up to you which way to treat your contributors: filter by Donation activity specifically (donors), or filter by any financial contribution activity. If you're looking for specifically donations, make sure to use the [YEAR] Donations and [YEAR] Donations Amount fields. If you're looking for overall contributions, you'll want to use the [YEAR] Contributions and [YEAR] Contribution Amount fields instead.